10% off all food and drink (not to be used with other offers). St Thomas and Evelina Hospital staff had very few economical restaurant choices in the immediate area in the past ... but no longer! Mamuska! 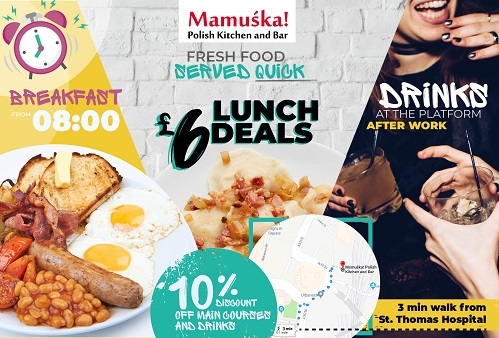 Polish Kitchen and Bar has just moved in to the Leake Street Arches under the rail tracks at 9 Addington Street, facing the Park Plaza hotels. We serve hot, healthy and CHEAP meals every day, including weekends, from 8am until 10pm. Our £6 lunch deals are almost as famous as our amazing craft beer and vodka, and with lots of seats you and your team don't need a reservation. We specialise in serving up hot meals in a hurry, so you can often be served in under 10 minutes, meaning you have plenty of time to enjoy the food and the company. Smacnego!